(Nanowerk News) Thanks to tiny microneedles, eye doctors may soon have a better way to treat diseases such as macular degeneration that affect tissues in the back of the eye. That could be important as the population ages and develops more eye-related illnesses – and as pharmaceutical companies develop new drugs that otherwise could only be administered by injecting into the eye with a hypodermic needle. For the first time, researchers from the Georgia Institute of Technology and Emory University have demonstrated that microneedles less than a millimeter in length can deliver drug molecules and particles to the eye in an animal model. The injection targeted the suprachoroidal space of the eye, which provides a natural passageway for drug injected across the white part (sclera) of the eye to flow along the eye’s inner surface and subsequently into the back of the eye. The minimally-invasive technique could represent a significant improvement over conventional methods that inject drugs into the center of the eye – or use eyedrops, which have limited effectiveness in treating many diseases. The study was reported in the July issue of the journal Investigative Ophthalmology & Visual Science ("Targeted Administration into the Suprachoroidal Space Using a Microneedle for Drug Delivery to the Posterior Segment of the Eye"). The research was supported by the National Eye Institute, which is part of the National Institutes of Health, and by the organization Research to Prevent Blindness. Researcher Samirkumar Patel displays a prototype microneedle used to inject therapeutics into specific locations in the eye. 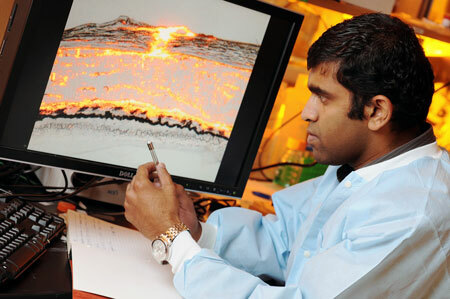 The image behind him on the screen is a magnified view of a site where fluorescent particles were injected into the suprachoroidal space using a microneedle. Patel, who is now director of research for Clearside Biomedical – a startup company formed to commercialize the technology – said the study also showed that the suprachoroidal space could accommodate a variety of drugs and microparticles. That could open the door for the use of timed-release drugs that could reduce the need for frequent injections to treat chronic eye diseases. Currently, doctors typically have two choices for administering drugs to the eye: eye drops and injection with a traditional hypodermic needle into the vitreous at the center of the eye. While injections into the vitreous do reach their target, they also affect other portions of the eye where the drug may not be desirable. Eye drops, which are simple to use, often fail to reach the structures being targeted, Prausnitz said. Henry Edelhauser, a professor of ophthalmology at Emory School of Medicine, said pharmaceutical companies are now developing new compounds to treat eye diseases. Those drugs will be most effective if they can be delivered directly to the portion of the eye that requires treatment, such as the choroid and retina that this new delivery method targets. “With this technique, we are keeping the drug right where it needs to be for most therapies of interest in the back of the eye,” he said. The microneedles used in the technique are made of stainless steel and are less than one millimeter long. The researchers believe that they will cause less trauma to the eye than the larger hypodermic needles, and reduce the risk of infection. The model compounds used in this study fluoresced inside the eye, showing researchers that they had reached their targets. But the compounds studied were not drugs, so the next step, according to Edelhauser, will be to study how well the microneedle technique can get real drugs to the eye structures of interest. The technology has been licensed to an Atlanta-based startup, Clearside Biomedical, which plans to advance the micro-injection technology developed in collaboration between the research groups of Mark Prausnitz at Georgia Tech and Henry Edelhauser at Emory. Clearside Biomedical was formed with the assistance of Georgia Tech’s VentureLab program, which helped obtain early-stage seed funding from the Georgia Research Alliance. Clearside has received $4 million in funding mostly from Hatteras Venture Partners, a venture capital firm based in Durham, N.C. In addition to those already mentioned, the study involved Damian Berezovsky and Bernard McCarey from the Emory Eye Center in the Emory University School of Medicine, and Vladimir Zarnitsyn from the Georgia Tech School of Chemical and Biomolecular Engineering. Development of the intraocular microneedle demonstrates the strength of collaboration between researchers at Emory University and Georgia Tech.